DON’T FORGET WAIVERS: Please fill out your waiver so you can experience the thrill of our tree top adventure. All Climbers must have signed waiver. UNDER 18: Waiver must be signed by a parent or legal guardian. Sorry, but it’s the law. SAFETY EQUIPMENT- Climbers must have a 44 inch waist or smaller to be able to use our required safety equipment. WEIGHT LIMIT There is no weight limit to participate on our courses. Climbers must be 7-8 years of age to participate on the Kids Course. Height Requirement: Children on these courses have to be able to reach the tips of their fingers to a height of 4’7″ (140cm) while keeping their feet flat on the ground. We know how much you want to see your kids having fun. That’s why we set up walking trails along the Kids Courses. At least one adult parent or legal guardian (aged 18+) is required to stay with their child. Please use the walk trails along the course to take photos and watch your child’s progress from the ground. Q. What are hours of operations? A. We are open daily 8 am and groups depart every 30 minutes. Last departure time varies by season. Call for reservations. Q. What happens in the case of rain? A. The Park is open rain or shine. In the event of heavy rain or lightning, climbers who have already started the course are required to return to the back deck (i.e. evacuate the Park) to wait out the weather. If the weather does not improve within a half hour, climbers may request a Rain Check to return and complete the Park at a later date of their choosing. If the weather has not improved within an hour of the evacuation, climbers will be provided with a Rain Check for the remainder of their climb for a future date. Refunds will only be available to climbers who have not yet started their climb due to bad weather. Same rules apply to group reservations. A. Reservations are strongly encouraged. To avoid any disappointments or a long wait we always recommend making a reservation in advance. Our departure times are every 30 minutes. Please arrive 30 minutes prior to your reservation to check in. Call 407-390-9999 or book your adventure now. A. We accept American cash, Visa Debit, and all major credit cards. Four (4) Adult Courses (12+) which includes a giant (425ft) zip line. Three (3) Junior Courses (9-11) which includes a giant (425ft) zip line. Q. How long on average does it take to complete the adult course? A. 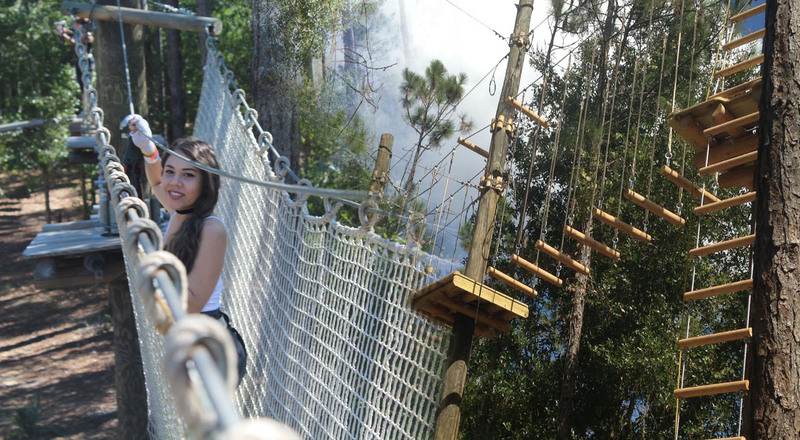 Although you can end your adventure at any time, it will take you approximately 2 – 3 hours to complete the adult course which includes a brief training session. A. When you have completed your waiver form and paid for your access, you’ll begin a brief group training session. At the training session, you’ll be fitted into your harness and your guide will show you how to attach yourself to safety lines and how to attach yourself to a zip line. Once your guide deems that you can safely use your equipment, you’ll be able to proceed onto your first course. A. Children must be a minimum of 7 years old. In order for children to be able to reach the safety lines and manage their way through the course they must be able to reach the tips of the fingers to a height of 4’7″ (140 cm) while keeping their feet flat on the ground. Q. Are there age/height restrictions for the Adult and Junior Courses? A. In order for guests (12+) to be able to reach the safety lines and manage their way through the Adult Course they must be able to reach the tips of the fingers to a height of 5’11″ (180 cm) while keeping their feet flat on the ground. The height restriction for the Junior Course (9-11) is 5’9″ (175cm). Q. How are the four courses in the adult course ranked in terms of elevation and difficulty? A. Each section of the course is marked using a color coded system indicating the challenge based on elevation and difficulty. Q. How are the three courses in the junior course ranked in terms of elevation and difficulty? Q. Can parents or guardians watch their children on the kids courses? A. At least one parent of guardians are required to supervise your child. There are walking paths that you can use to take memorable photos and memories. A. Appropriate footwear and clothing is required for safety purposes: No open-toed shoes; no slip-on shoes; no loose baggy clothing or shirts wrapped around the waist; long hair must be tied back; and, we strongly recommend no jewelry – especially necklaces or loose bracelets which could get caught in equipment. We recommend that you wear clothing that you don’t mind getting dirty (you’re outside, it just happens). Guests can be refused access to the course if they do not have appropriate clothing to meet our safety standards. Climbing gloves for guests are available at the counter for a $3.00 fee. A. If you don’t proceed onto a course immediately following the end of your training session, you may be eligible for a partial refund. Once you have finished your training and you start on any of the courses, you’ll have forfeited any refund options.